Busy busy Monday ahead! Oh boy! Is it me? Or is the world spinning off its axis ? I know it’s gone mad, I know we’re living in a mental world, and I appreciate that we’re all doomed. But this breakneck speed is making me dizzy! So let’s just change down a gear, take our foot off the pedal – and make a pretty card. At least while we’re doing that, we can’t break any speed limits! Now here, you can see that I have picked the Lizzy (As in Lisianthus) and combined it with the brick wall. All sets are clearly interchangeable. 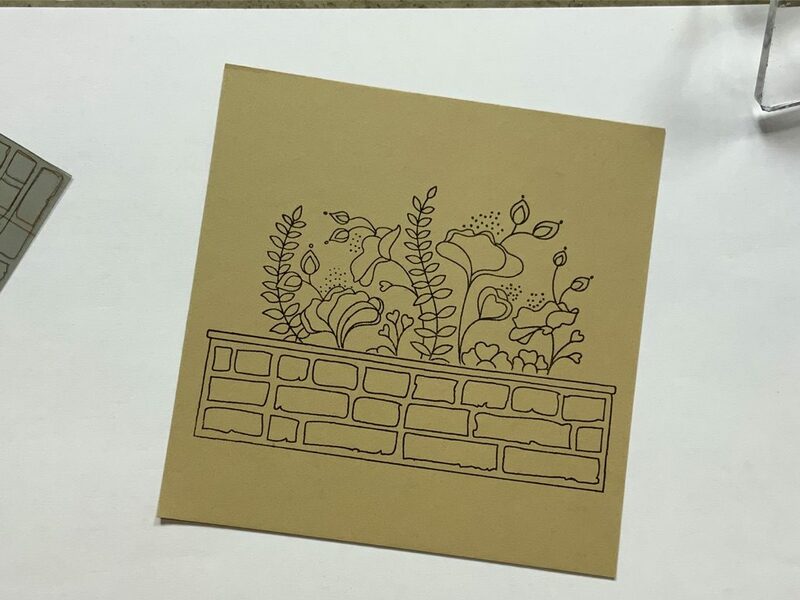 Stamp the brick wall in black Archival ink on a piece of our Kraft Card. and cover up with the mask provided. Next, stamp your flowers of choice over the top, making sure that the base sits on the mask. Remove the mask. 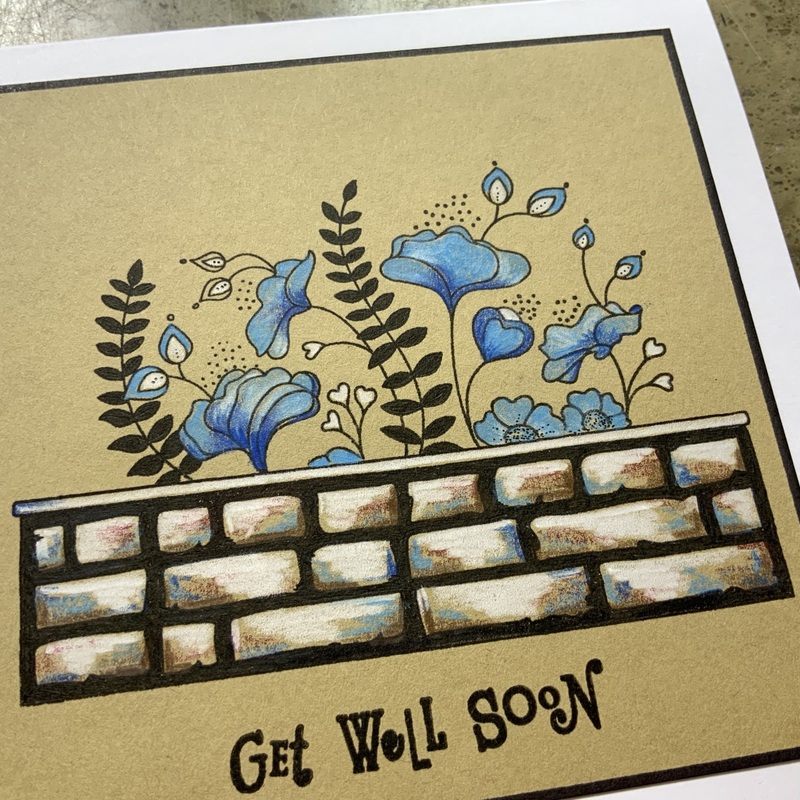 Now the flowers are behind the brick wall on the kraft card. We give you a white Pergamano pencil with every Bundle of Kraft card. It works beautifully on the dark card. 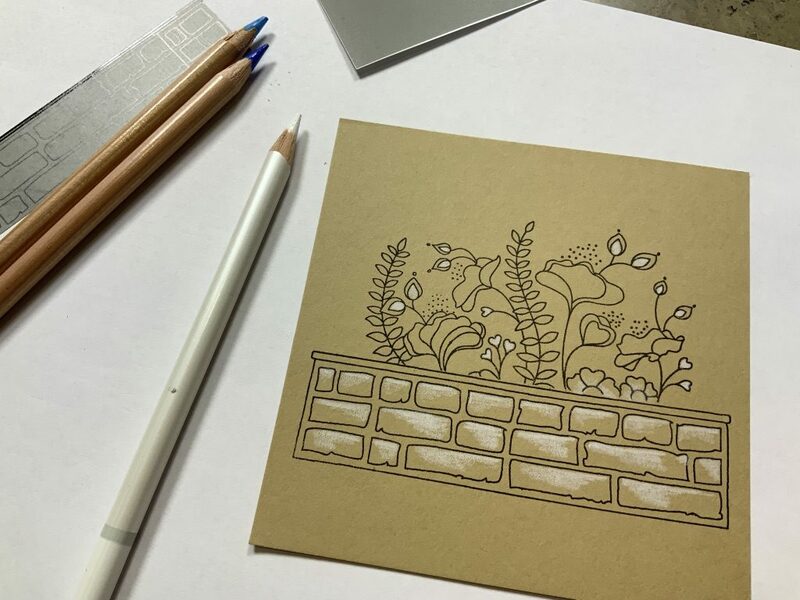 Add highlights to the flowers, buds and bricks. Use Pergaliner pencils to colour in the main flowers. Blues work beautifully on Kraftcard, don’t you agree? Colour in the bricks roughly. Black out inbetween the bricks and black out the leaves using a micron pen. A little black edging and mounted on white. Job’s a goodn. Simple, quick and pretty. That’ll do today! On Thursday, our super talented Tina and I will be gracing your screens on HOCHANDA, with a little lesson in effective doodling. I do hope you have time to join us at 11am and 2pm. We’ll be working on our Designer Paper and Designer Parchment, and there’s a mega super deal on those two products that day. Well worth stocking up on! 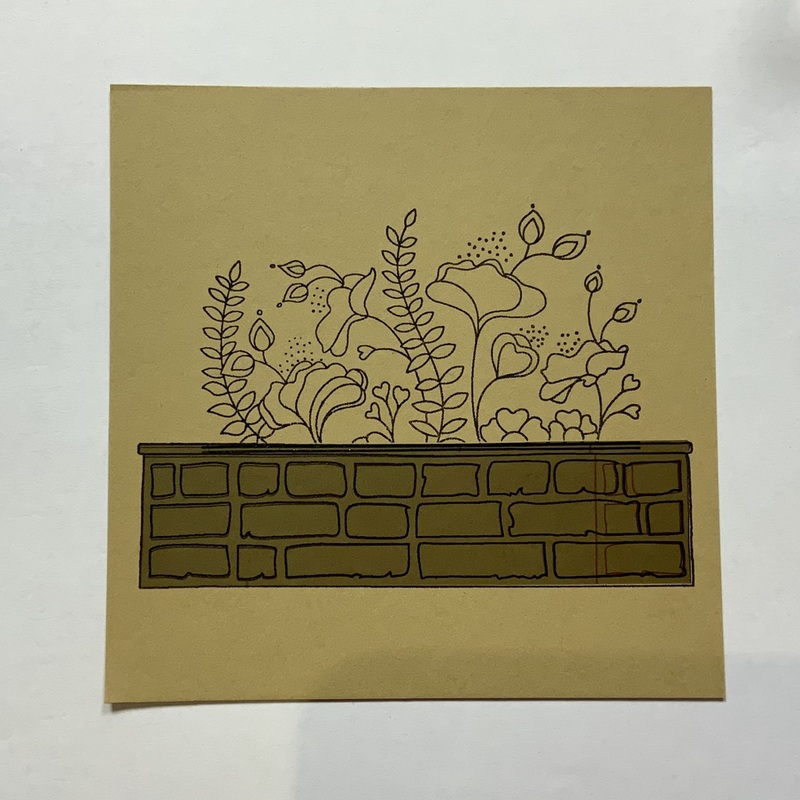 In the mean time, I also really want to encourage you to invest in our Kraft card – mainly because it stamps up so beautifully, and takes colour so perfectly! So let’s say that for the next 48 hours we will drop the bundle price on 80 cardblanks from £29.96 to £20. Including the white pencil of course! I know!! £!0 savings?? Plus your club discounts?? She’s getting soft!! No, she’s not. She just thinks that £20 is a baaaaarginnnnn! You’re absolutely right about how quickly this year is going!!! It’s less than 4months to Amy’s big day and I’m beginning to go into panic mode… I don’t think Amy is although when I see her at the weekend I will be able to tell a bit more! I love those stamps and what you’ve done with them looks amazing. I think a shopping trip to the website may be in order today! 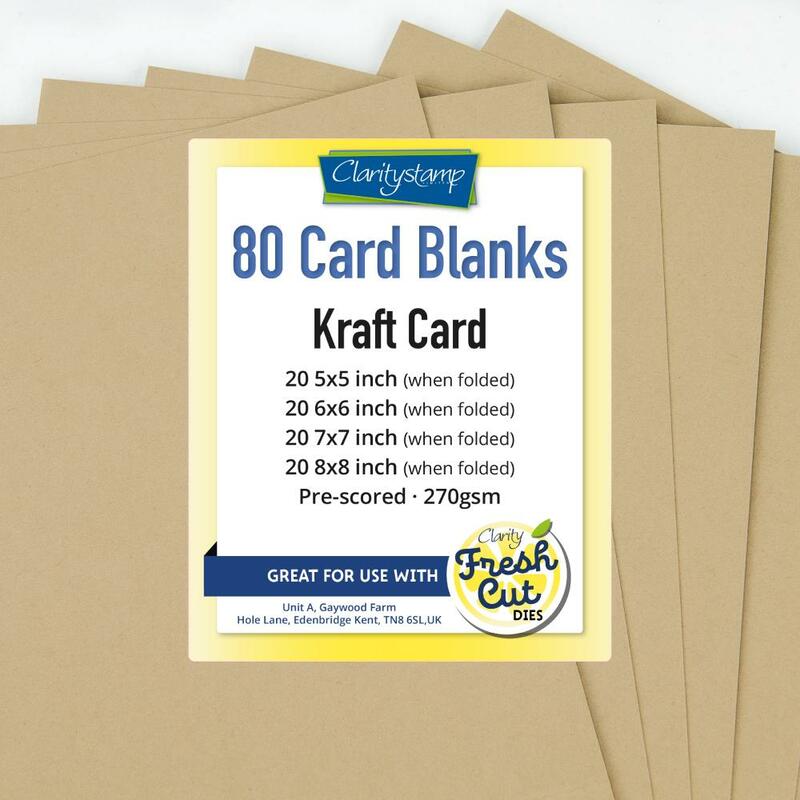 The kraft card is fabulous. Its smoother than most. This week we have some great shows from clarity coming up and I’m looking forward to seeing all the demos. Have a great week! I hope you get time for yourself in all of what’s going on!! I love these stamps and your example is beautiful. I will be taking advantage of your generous offer on the craft card as my first pack is half gone !!! As for time flying, I don’t know where the first quarter has gone. I always seem to be chasing my tail to get things done. Is it because I’m getting slower as I get older or because I’ve already started making my charity Christmas cards in between parching? 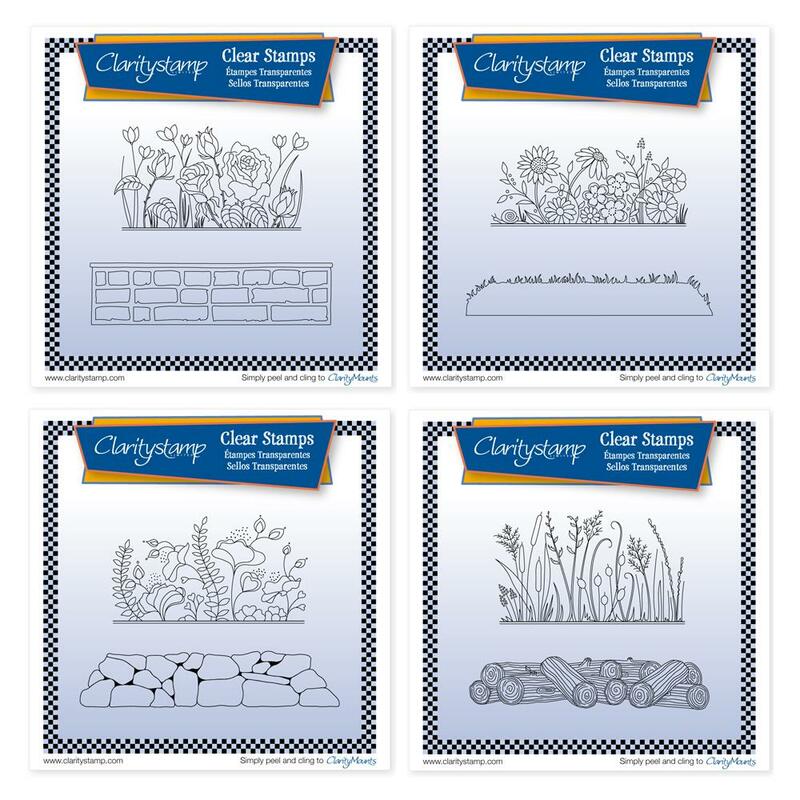 It will be interesting to see the doodles on Thursday and maybe incorporate the ideas with my Zentangles. Do try to step out of that whirlwind occasionally. I agree the world seems to be going mad but perhaps if WE KEEP CALM AND CARRY ON it will improve. Beautifully sunny today here in Norfolk, just right for mowing the lawn now the snowdrops are finished. Busy, busy, coffee break over, must get on. Hi Barbara and everyone, well what a beautiful day, will we have to suffer for this later never mind just enjoy while we can. What a lovley card the blue and white work well together. Yes as you say ,it seems as if we are always busy even after retiring even more so . Well tonight I am going to take myself off to my craft room and play with my Fresh Cut dies joy ,while the husband watches football. Hope you all enjoy your evening. 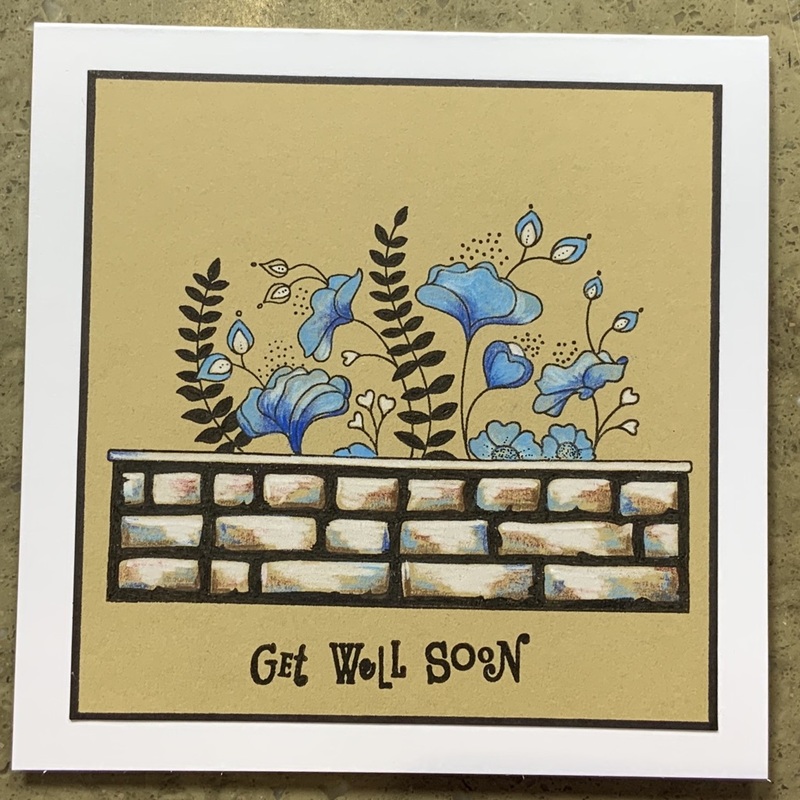 Beautiful card, I love the stamps and have the one with the grass and had a try with it on Kraft card. I used different colours though, but the blue really does pop. Thanks for the wonderful inspiration and take care.